Amazing 6 Bedroom Condo Right on the Bay with Private Dock! This beautiful, privately-owned townhouse has 6 Bedrooms, and 6.5 Bathrooms. It was completely rebuilt in 2010 and has a Fully-Equipped Kitchen, Extra Bedroom Loft, Game Room with Pool Table, Ping-Pong Table, and Air-Hockey. Four Balconies, Furnished Outdoor Decks, and Private Fishing Dock With Underwater Lights. 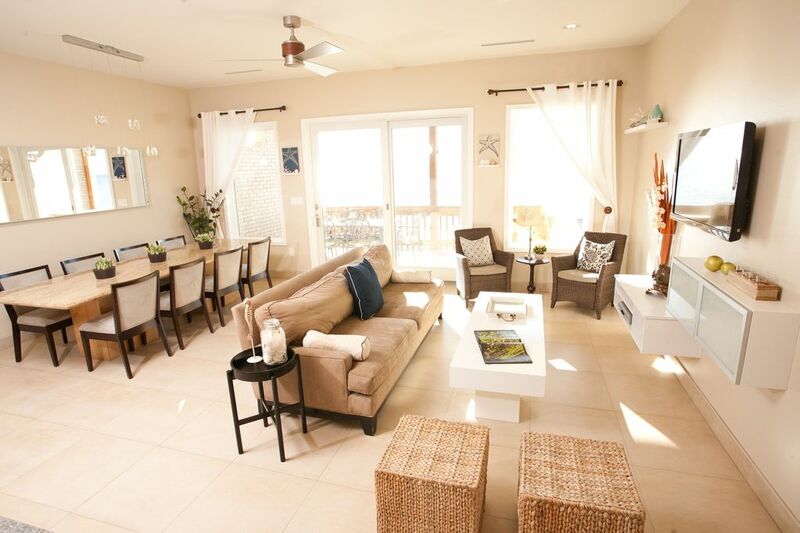 This amazing vacation home also includes numerous amenities for your beach outings such as: beach bicycles, beach chairs, boogie boards and other beach toys for fun in the sand. For those who prefer to have their fun on the bay we have kayaks, fishing poles, and water skiing equipment (water skis, kneeboard, wakeboard, towable tube). The dock has a 25 ft. fishing pier with underwater lights that attract all kinds of fish at night. The dock can accommodate a 25 ft. boat and comes prepared with cleats and bumpers. For those guests who do not bring a boat but want to enjoy boating and fishing activities, we offer a bay boat for rental as well. Ask for details. Boasting over 4,000 sq. ft. of living space, this huge 4 story condo is perfect for large families or groups who want to save some $ and stay together under one roof. With 6 bedrooms and a loft, this property sleeps 20 guests in real beds. No uncomfortable sofa sleepers or built in bunk beds. This is the ideal vacation rental for family reunions and small events. We've hosted numerous weddings, retreats, reunions and high school trips. Prepare yourself to create memories that will last a lifetime !!! This is an amazing vacation home. There are so many activities for families on the island and at our home that you'll never want to leave. This townhouse is right on the water. You can fish from the dock, swim in the bay, use our kayaks or bring your boat (or rent ours) and dock it next to our private pier. 3 Refrigerators available. Kitchen, Garage, Game Room. Additional seating in kitchen island. TVs in all Bedrooms, Living Room and Game Room. 2 balconies facing the water. 2 balconies facing parking area. 4 Kayaks Available for Use. Air Conditioning, Wireless Internet, Cable TVs in every bedroom, DVD, Bluetooth Speaker, Fully Equipped Kitchen, Microwave, Dishwasher, 3 Refrigerators, Ceiling Fans Throughout, Cooking utensils provided, Linens provided, Washer & Dryer, 2 Car Garage, Charcoal Grill (BBQ) Other Amenities may include: Kayaks, Water Skiing Equipment, Fishing Poles, Beach Bicycles, Boogie Boards, Beach Chairs, Beach Toys. This condo was wonderful for our family of 13. It has something for everyone to enjoy. Many amenities and the owner, Klaus, was most accommodating. Our family would rent again and again! Amazing property and very helpful owner! This was a wonderful place to spend our 25th anniversary with great friends. There was plenty of room and everyone enjoyed the game room, kayaks, wake boards, private dock and everything else about the property. Klaus was extremely accommodating and prompt with every little question we had. Would highly recommend this property! This is a great condo. It has all the amenities needed to entertain both young and old. Our family has been using VRBO for about 8 years now for our family reunions and this place is amazing!! Kayaks, beach bikes, umbrellas,beach chairs, etc Everything listed in the description was there and in working order. The kids loved the game room and about every night you could hear laughing and competing going on while the adults were relaxing downstairs. Well maybe some of the adults were in on it too.....There was plenty of space for everyone; and with 16 people, the 6 bathrooms came in handy. The picture don't do the place justice the décor was very light and gave a very relaxing feeling. There are many activities to do on the island and most are with in a few minutes drive from this house. THANKS KLAUS FOR LETTING US STAY AT YOUR GORGEOUS HOUSE!!! !